Radio personality, standup comic, entertainer Mitch Henck is one of the world's great story tellers. 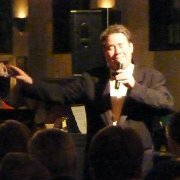 Whether hosting his daily talk show on 1310AM WIBA, Madison, Wisconsin...cracking up a young crowd at a Comedy Club...or singing the songs of Sinatra while headlining at a night club with Mitch's Big Show, Mitch has memorable, very funny stories to tell about life — his life, his kid's life, your life! "Mitch Henck put on a wonderful dinner show for our members. His music and style were thoroughly entertaining and the show received rave reviews. We look forward to having Mitch back to the Madison Club." General Manager. The Madison Club. "I've seen The Big Show three times and I'm going back for more. Hilarious comedy and great songs from a gifted and immensely likable entertainer. My lady and I fell in love at The Big Show. I owe you, Mitch." daily columnist, The Wisconsin State Journal, author of "The World of Mike Royko" and "Lords of the Ring." "The Big Show is unique because you have a great comedian who also sings beautifully. I can't wait to see the Big Show for the fourth time!" award winning television producer and former host of PM Magazine. "The Big Show made the Arc Wisconsin 60th anniversary celebration extra special. Mitch's music and comedy was the highlight of our evening. Some attendees are planning to book The Big Show for their organizations' events." He began his preparation for a career in entertainment at the age of 7, practicing basketball play-by-play watching television. A lover of good music from early on, while his friends were listening to Bread and Van Halen, Mitch's favorite music was anything by Francis Albert Sinatra. © 2010-2019 Mitch Henck All Rights Reserved.